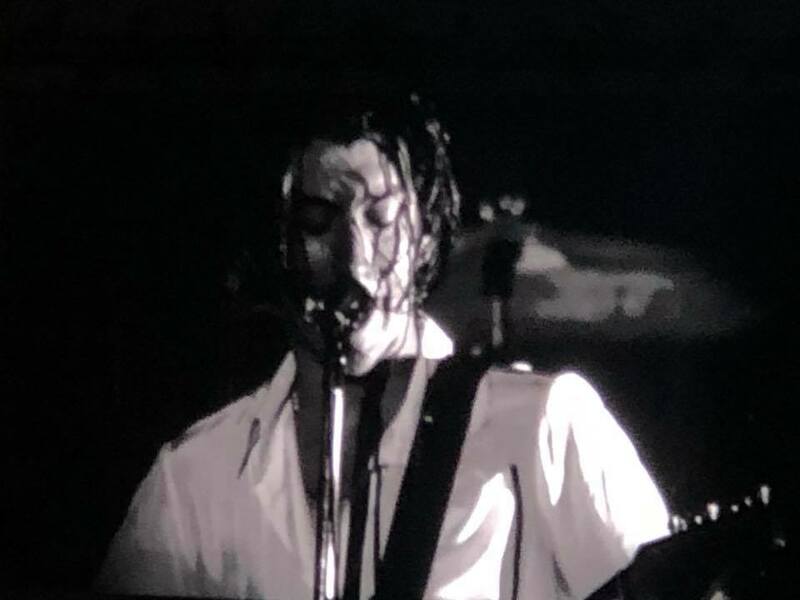 Day 2 of Mad Cool Festival saw Arctic Monkeys headline the main stage with little repeat of the chaos at the gates and food stalls and bars that marred the first day. 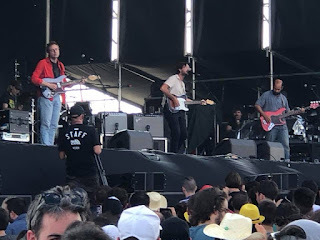 We also caught Marica, Real Estate, The Big Moon and Wild Front before the headliners delivered a set heavily focused on new album Tranquility Base Hotel And Casino and AM. We started Day 2 in the Mondo Sonore stage to shade from the blazing sun and were fortunate enough to discover Marica. 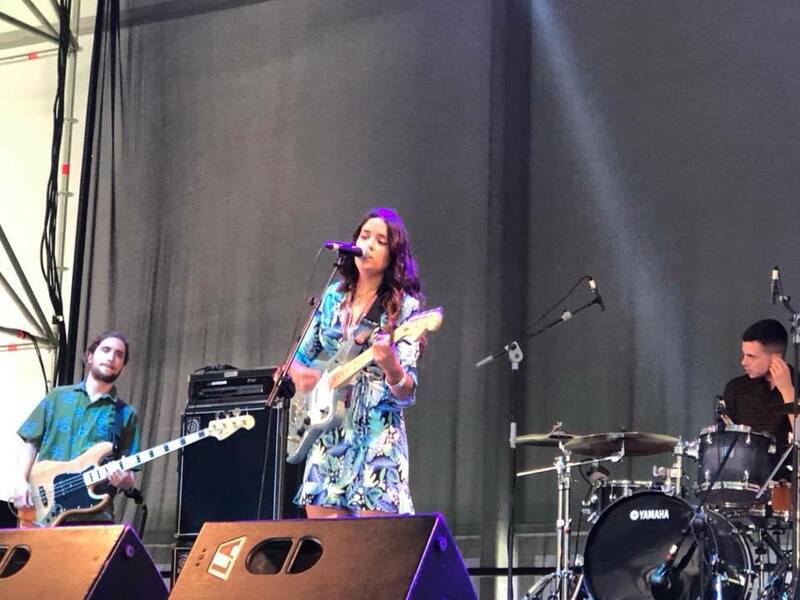 The Murcian singer was appearing at the festival with her band as a result of winning an on-line poll and it wasn't difficult to see why so many chose her in the public vote. Her songs are beautifully crafted, light and airy and perfect for the early evening heat. 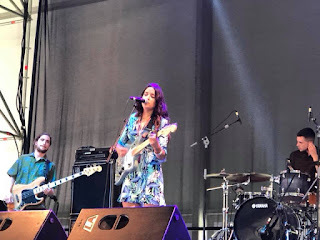 Her recent single Hot Sand is a perfect introduction to her, whilst she introduces (we think) another new song that's due for release in October that has a similar vibe to it. We leave mightily impressed by the newcomer. 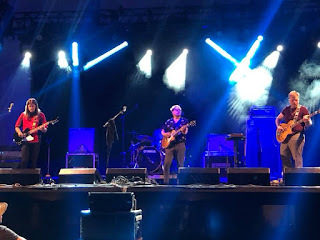 A big crowd has developed at the KOKO stage for Real Estate, up against their friend Kevin Morby on the main stage who they share shoutouts to each other with thanking respective crowds for choosing them. Real Estate are the perfect band for a late summer's evening festival slot with a beer in hand. Their songs are warm, inviting and comforting, allowing you to save the energy of dancing and jumping about for later in the evening. Beautiful melody-laden songs like Had To Hear, It's Real, Two Arrows and Talking Backwards as well as two new ones from the album they're in the process of recording are the highlights of a perfectly paced set that has the crowd listening attentively and swooning at the richness and depth of these songs. Next up are The Big Moon on the Thunderbitch Stage (it's the name of a shot that's sponsoring the stage) and they have the biggest crowd we've seen in this tent that also hosts the Mondo Sonore stage. Their eight song set is rapturously received, focusing primarily on the hook-laden singles that made up their wonderful debut Love In The Fourth Dimension. 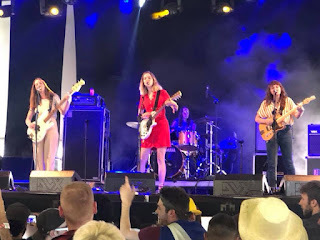 Silent Movie Susie opens up proceedings and the rougher edges that The Big Moon have live when they're not delivering the gorgeous harmonies that make them a modernised throwback to sixties girl-groups but armed with guitars. They've got a effervescent joy to performing, whether it be when Juliette, Celia and Soph circle Fern's drums at the end of The Road or in their interaction with the crowd throughout, and the songs are uplifting and fun, whilst packing a killer punch underneath. They add in a cover of Bonnie Tyler's Total Eclipse Of The Heart which they transform from an eighties anthem into something that wouldn't be out of place on their own record. They go down a storm and rightly so. 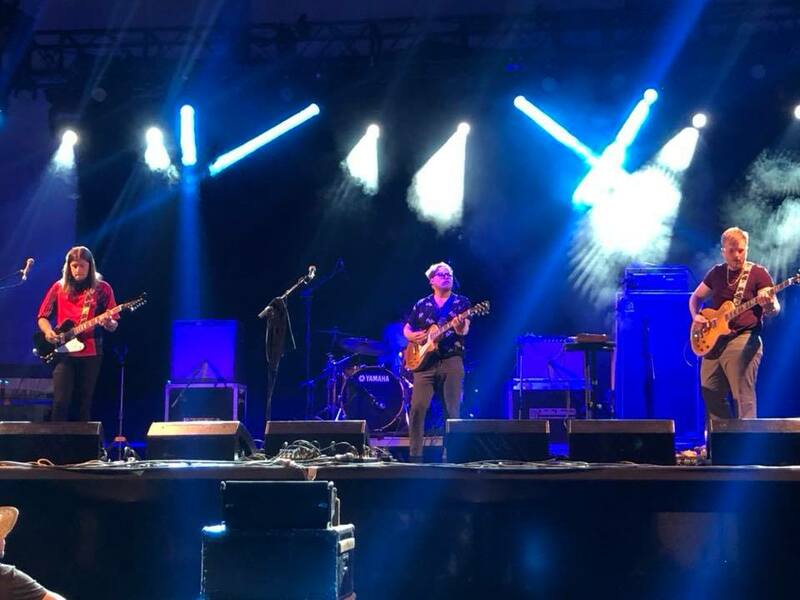 This is Southampton's Wild Front's debut show in Spain so a 10pm slot at a major festival is quite a coup for the four piece and they deliver a set that shows they're developing rapidly into a band that's going to take a major shot at breaking through in the next twelve months. They've got big anthemic songs that reach out to the crowd - like Mexico, previous single Physics and new single Dive. that are being delivered with an increasing confidence in what they're doing, and not surprisingly given how far they've come, particularly in Jack's vocal delivery which now sounds like it belongs on stages like this and bigger, in the twelve months since we first saw them. The crowd that haven't been drawn across to Jack White give them a rousing deserved response too. It's then Arctic Monkeys time. 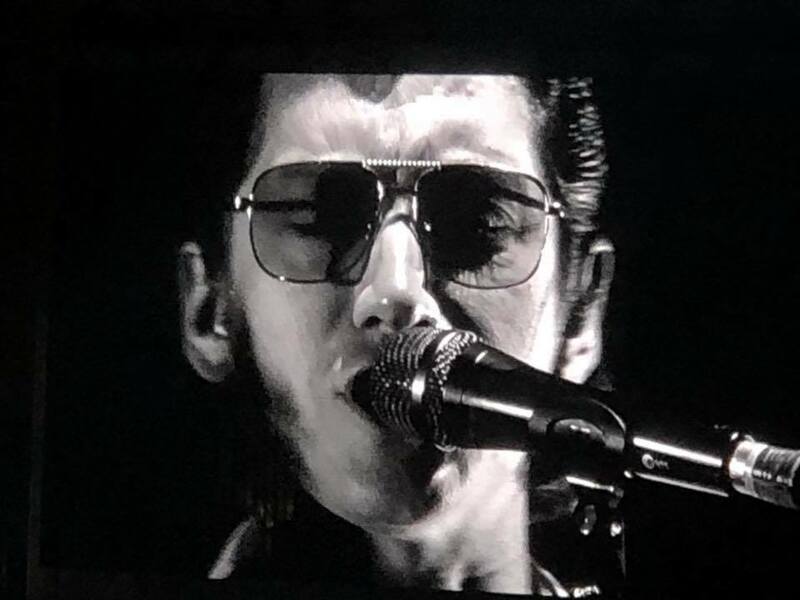 Much has been made of their new album Tranquility Base Hotel And Casino and its radical change in direction for the band and how it would fit into the live set. Opener Four Out Of Five answers that question unequivocally - whereas old school Arctic Monkeys would often rely on adrenaline in their sets, this is a more measured approach, a change in style that has risks that have to be applauded as they could easily have just churned out a repeat of AM and most people would be delighted. There's a soulfulness to the new songs, of which they play four more with the standout being the album's title track, and a rich depth to Alex's voice, particularly on the songs where he's seated at keyboards, that often goes unheralded, and you can sense a lineage here to the great Sheffield acts such as Pulp and Richard Hawley under whose influence they grew up as a band. 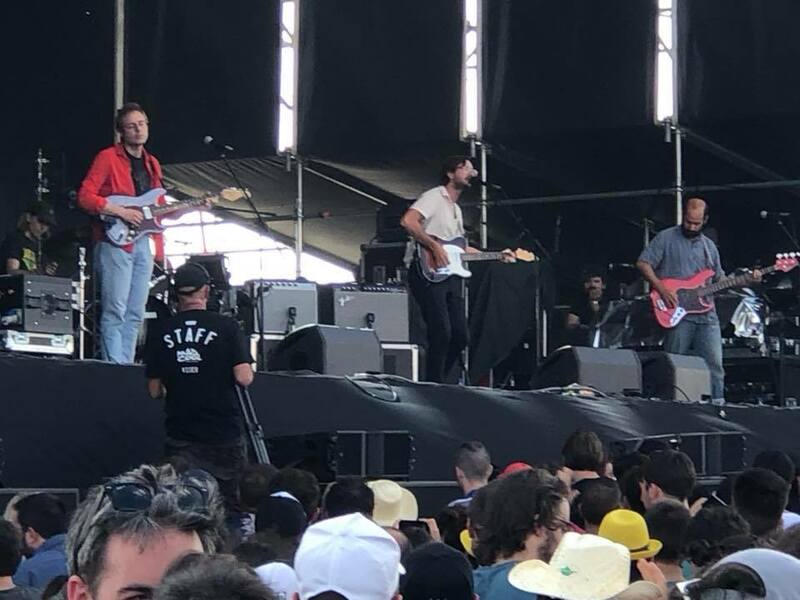 That's evident to in the tight control that Matt, Jamie and Nick impose on the songs, never allowing them to drift away even when the head rush of the faster songs can't be used to control the crowd reactions. Like all bands in their situation, the best response they get is for the bigger hits - the encore duo of I Bet That You Look Good On The Dancefloor and a stretched out R U Mine? that brings the night to a close being a case in point, but the setlist is managed so that you're never too far away from a song that pulls any drifters back in - in fact it's only Why D'You Only Call Me When You're High and Do I Wanna Know? midset where two songs from the same record are paired together. It's a fine line to walk for a headliner desperate to play new material that they've lived for the past twelve months of its creation and meeting the expectations of tens of thousands of people who want the hit of the familiar to sing along to and they just about get it right. They keep things simple. There's a backdrop that spells out MONKEYS in white and a lighting show that's understated and keeps the focus on the music rather than the spectacle, much like their setlist choices. Alex doesn't say much either between songs, the band looking to use their ninety minute slot to the full with an impressive twenty songs which cover most bases of their career to date. A band with an urge to create something different will always have their detractors, those that simply want a rehash of the original band, yet Arctic Monkeys refuse to rest on those laurels and still justify their headline status along the heavyweights of the other two nights of the festival. Arctic Monkeys played Four Of Out Five, Brianstorm, Don't Sit Down 'Cause I've Moved Your Chair, Crying Lightning, Teddy Picker, Knee Socks, 505, One Point Perspective, Do Me A Favour, Cornerstone, Batphone, Why'd You Only Call Me When You're High?, Do I Wanna Know?, From the Ritz to the Rubble, Tranquility Base Hotel And Casino, Pretty Visitors, Arabella, Star Treatment, I Bet You Look Good on the Dancefloor and R U Mine? Arctic Monkeys' official site can be found here. They are on Facebook and Twitter. Wild Front are on Facebook and Twitter. Real Estate's official site can be found here. They are on Facebook and Twitter. Mavica is on Facebook and Twitter.